Military Note He was a corporal in the Cambridge Farms military company as early as 1692. 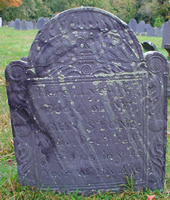 Family RACHEL SHEPHARD, b. Abt 1665, Concord, Middlesex Co., Mass. 1. Rachel Stone, b. 12 Mar 1688, Lexington, Middlesex Co., Mass. 2. John Stone, b. 15 Dec 1689, Lexington, Middlesex Co., Mass. 4. ANNA STONE, b. 27 Nov 1694, Lexington, Middlesex Co., Mass. He was a farmer in his native town and is styled in records of �The Farms� as �corporal� and �east� to distinguish him from his cousin John Stone (David) who was �west�. His will can be found at Middlesex County Probate Records, No. 21623.